Fall in love with a poolside space that creates the ideal summer dream. Imagine a space filled with evergreen boxwoods, creating structure. Add some Hydrangeas for the splendid color of their huge summer blooms. Drop in some spectacular roses for color and fragrance. Spice it up with some catnip and other aromatic perennials to weave together the shrubs with added color and depth. It is perfect for relaxing and falling in love all over again. A Caribbean inspired subtropical paradise can thrive with our hot humid Northern Virginia summers. This especially popular theme can be successfully developed in you poolside landscape. Plantings of non-hardy Cannas, Banana trees, Hibiscus, Oleanders, Jasmine, Mandevillas and other popular tropicals can be supplemented with large hosta’s. Add some hardy hibiscus (HUGE dinner plate size flowers) and even a large leaf tropical Magnolia, slipped into the mix, can create a tropical oasis envied by everyone. Some wide-bladed ornamental grasses add to the lush tropical feel of your tropical poolside oasis. There a quite a few wide-bladed ornamental grasses that are winter hardy and work well in Northern Virginia.With this approach, your tropical poolside landscape can still be interesting during the winter months when you have moved you heat loving plants indoors. For shady areas Elephant Ears, Caladiums, and Cannas can create wonderful textures and colors. For sunnier areas nothing can beat the spectacular beauty of the Bird of Paradise. Poolside gardens are terrific areas to have fun exploring a themed garden approach. 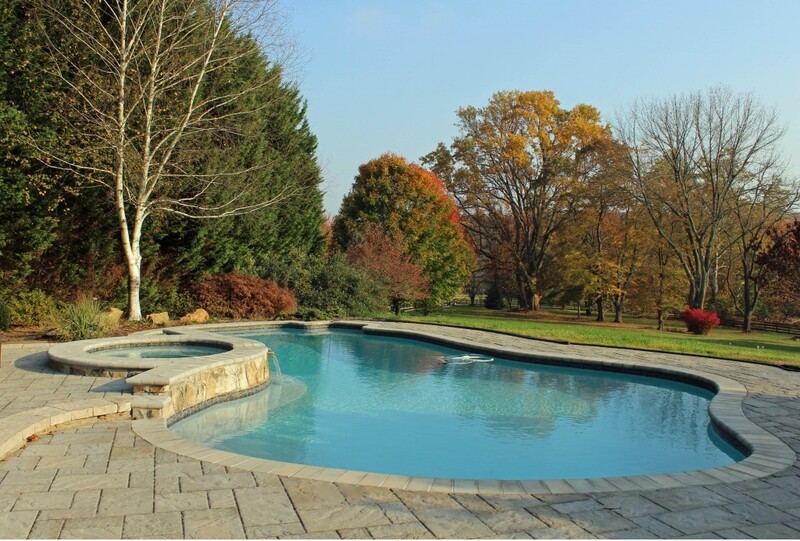 The space around the pool is initially treated much the same way as a new garden. Evergreen trees are favored to create a screen from unwanted views and add to a sense of seclusion. Deciduous trees will add some cooling shade during the summer. Summer flowering trees and large shrubs, such as Crepe Myrtles, are very popular and attractive poolside. These elements are used sparingly to avoid too much debris from falling into the water. It is important to break up the hardscape areas to create a garden oasis. 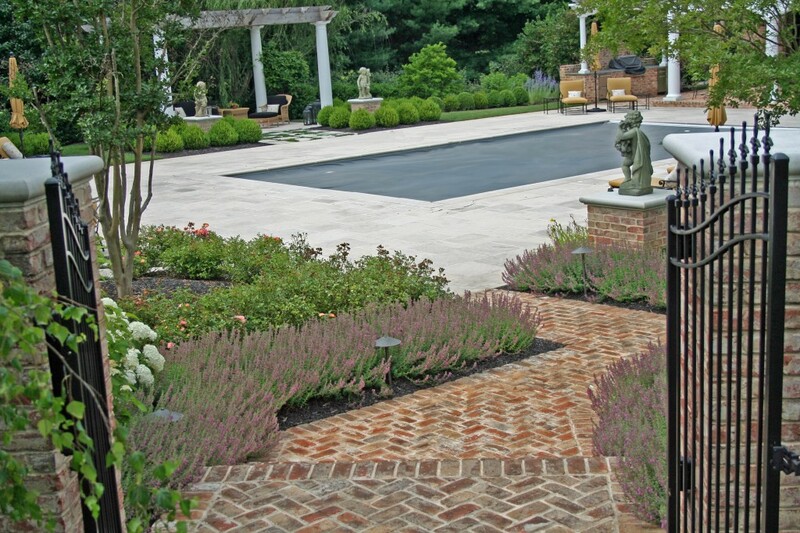 The shape and location of paved surfaces are very important to the usability and overall impact of you poolside garden. Containers and potted plants can be creatively used to add color and interest while softening the hard edges of your poolside area. Too often pools and gardens are distant relatives. The sound of water adds serenity to any outdoor living area. Whether you are hosting a party or dangling your feet in the water while reading a book, a poolside garden can add a sense of luxury and comfort to your outdoor living room. Give us a call if you would like to see what we can do for your poolside garden.